Brick siding prices range from $6 to $12 per square foot installed. This includes the cost of the bricks themselves, all of the additional materials needed and the cost for the installation. Brick siding can be used either as an accent on a small portion of the home or can be used as the entire cladding. For additional pricing, see our brick siding cost calculator page. Entry to mid quality bricks will run $.50 to $1.50 psf. This level of brick is typically your standard red clay brick, although homeowners will usually have a variety of color options. Mid quality to premium grade bricks will run $1.50 to $3 psf. These will typically be different sizes than your standard brick, use decrative colors and/or finishes. There are additional material cost associated with mortar, underlayment, corner pieces and any accessories or decorative touches on a project such as this. 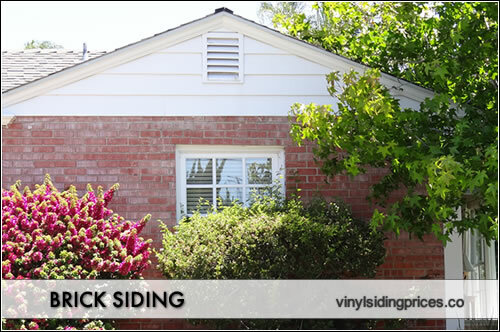 Unlike a simple vinyl siding project, brick siding can involve some expensive materials and the price for these materials will depend on how much they are used and the quality of the products. Brick installation costs are high, especially when compared to other materials. The labor portion will need to be done by a mason with extensive knowledge of brick and mortar and the framing requirements for these projects. Brick is heavy and can add significant structural demands on the frame of a house. Proper installation is a must. Entry to mid quality projects will run $6 to $9 psf. This includes the bricks, all of the additional materials needed and the cost for the installation. Mid quality to premium grade projects will run $9 to $12 psf. This includes the bricks, all of the additional materials needed and the cost for the installation.